Okay people, who else is ready to celebrate some Chanukah? Great food, Great games, Great songs! And guess what? It’s a Great story too! 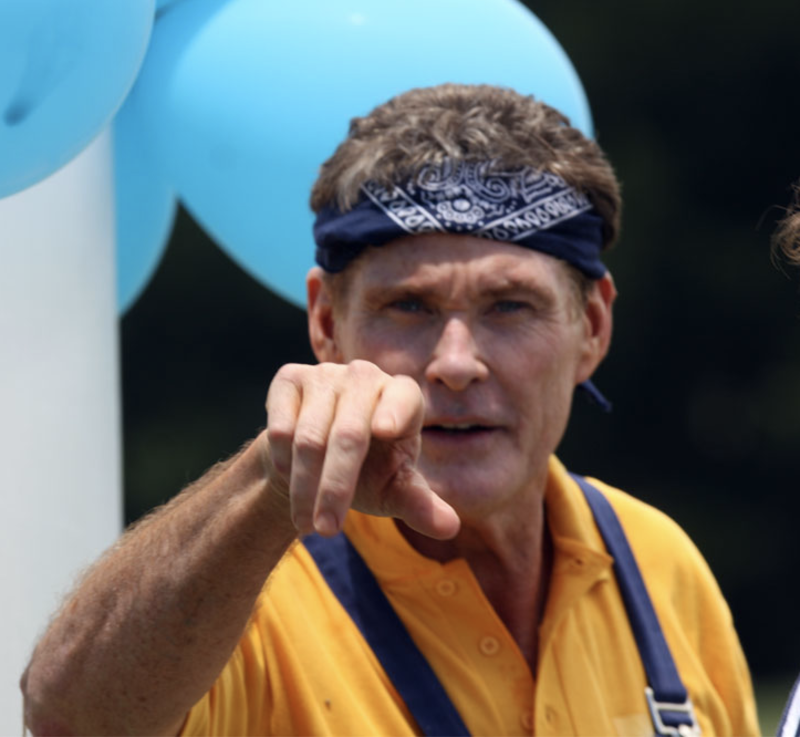 Now let the Hoff take you down memory lane for a few minutes! So a long time ago, like 2300 years ago, the Ancient Greeks conquered Israel. And things were OK for a while, but then it just got weird. And somewhere around Episode 3, the Greeks became Syrians and got a bad King named Antiochus. So the Ancient Greeks worshipped a bunch of Gods and did their workouts in the gymnasium without any clothes on, and tried to force the Jews to worship all the Gods, and exercise naked. OK all the different gods is a bit weird, but can we give them a pass on the not wearing a lot of clothes thing? I mean, maybe they could film the scenes in slow-motion or something. With red swimsuits! It’s kinda good for the ratings, trust me on this. Wait where was I? OK, so there was a guy named Judah Maccabee, and he decided to stand up and fight this crime with the help of his brothers and an incredible black chariot with these moving red LED lights on the front. And the chariot could talk and it would give Judah Maccabee advice and stuff. I mean, how cool is that? Then Judah and his brothers told the Syrians; “Hey! We’re Looking for Freedom from your unfair rules!” So they led the Jews against the Syrian Army. But it was tough. The Syrians shot lots and lots of arrows at the Jews, and they had to avoid getting hit. Kinda like Dodgeball. But in the end, Judah Maccabee led the Jews to victory. And the Syrians learned a very tough lesson: Don’t Hassle the Hasmoneans! And then they went back to their Temple, which was totally trashed. And they had to light their big lamp, and even though there was only enough material oil to last one day, somehow they stretched it out to 8 seasons days! Again, did they film it in slo-mo? No idea. And today we celebrate this holiday with tasty doughnuts. And latkes! the latkes are so good, I could eat them off the floor! Jerusalem: People around here have seen a lot, but something is different this week. On Wednesday, something happened that was so profound that it very well may have been a modern Hanukkah miracle. Ketchup heiress/Navy Veteran/Dude who lost to Dubya/Diplomat John Kerry spoke for 75 minutes without actually having anything to say. With only enough relevant ideas to fill a 5 minute chat, Kerry somehow summoned enough J-Street talking points, Senate anecdotes, and Thomas Friedman clichés to make his talk last 75 minutes. Nes Gadol Haya Sham! So the Daily Freier hit the streets to find out the word. On the streets. As the Daily Freier exited Jerusalem’s Central Bus Station, we ran into a familiar face: Alert Local Ronit S., who was on her way to the Ministry of Education to get a scuba diving certification from Cancun translated into Hebrew so she could be a dive instructor or something. We asked Ronit if she heard the speech. The Daily Freier jumped off the Light Rail and walked over to city hall where several children sat in a circle playing dreidel. “Gimmel” shouted one boy as he grabbed a handful of candy from a pile in the center. “Hay” shouted another, as he too grabbed some candy.